WPF 3D can show transparent 3D objects. But to show them correctly, the transparent objects need to be defined after all the objects that are visible through them. 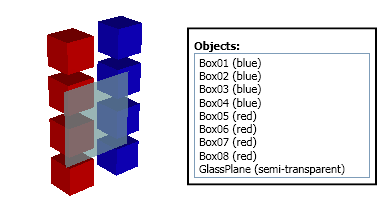 To solve the problem, the GlassPlane needs to be moved after the non-transparent objects. The following image is showing the correctly rendered scene. For cases when the number of transparent objects is not big and if the transparent objects are not positioned in 3D space one after another, the simple transparency sorting is usually enough to produce correct rendering in WPF 3D. But simply moving transparent objects after non-transparent objects is not always enough. For example if transparent object A is visible through transparent object B, than B must be defined after A. The problem in this case occurs when the camera is rotated so that B is visible through A. Now B must be defined before A. To solve this problem correctly, firstly the transparent objects must be moved after non-transparent objects and than transparent objects must be sorted by their distance to the camera. The sorting must be done after the camera is changed. 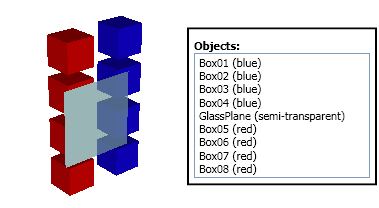 Ab3d.Reader3ds can perform a simple transparency sorting by moving transparent objects after non-transparent objects. Transparency sorting is performed if the IsTransparencySortingEnabled is set to true (by default). It is also possible to get the number of transparent objects by the TransparentObjectsCount property. Ab3d.Reader3ds does not do any sorting by camera distance. For this the Ab3d.PowerToys library is needed. With TransparencySorter class from Ab3d.PowerToys library it is possible to perform simple transparency or to ByCameraDistance transparency sorting where the transparent objects are sorted by their distance to the camera. When sorting by camera distance is used, the TransparencySorter can also automatically resort the objects when camera is changed. To optimize the sorting it is possible to specify an angle that will tell how much the camera's direction must be changed when the resorting is preformed. For more code samples see the samples that come with Ab3d.PowerToys library. It is recommended to set IsTransparencySortingEnabled in Reader3ds to false. After the 3ds file is read, check the TransparentObjectsCount to get the number of transparent objects. If there are no transparent objects found, than no transparency sorting is needed. If there are only a few transparent objects, than a simple transparency sorting can be made with using Ab3d.Utilities.TransparencySorter.SimpleSort method. If there are more transparent objects read or if there are only a few of them and you want to be sure that they will be correctly sorted, create an instance of TransparencySorter class and call StartSortingOnCameraChanged method to resort the transparent objects when the camera is changed. Copyright © 2019 AB4D d.o.o. All rights reserved.